The church is the oldest surviving building on the Ickworth Estate, and the only reminder of the earlier parish of Ickworth, which included a medieval manor house and village. A detailed history of the church is available in the Ickworth Church Guidebook, on sale in the church. Ickworth Church is the oldest building on the Ickworth Estate. A church was first mentioned here in the Domesday Book of 1086, as a possession of the Abbey of St Edmunds in Bury, but no trace has been found of this building. The earliest parts of the existing church date from the mid-13th to 14th centuries, and it may have been founded by Thomas de Ickworth, who was granted land here for a deer park by the Crown in 1254. During the Middle Ages the church served a small village, whose exact whereabouts are unknown, alongside a manor house. Ownership of the manor and church was disputed at this time and was only resolved when the last direct heir of the de Ickworth family died in 1432. The estate passed to the Drury family and then, through marriage, to the Hervey family. They subsequently became the Earls and Marquesses of Bristol, and remained owners of the church and Ickworth Estate until the 20th century. The church has undergone four major redevelopments since its medieval beginnings. 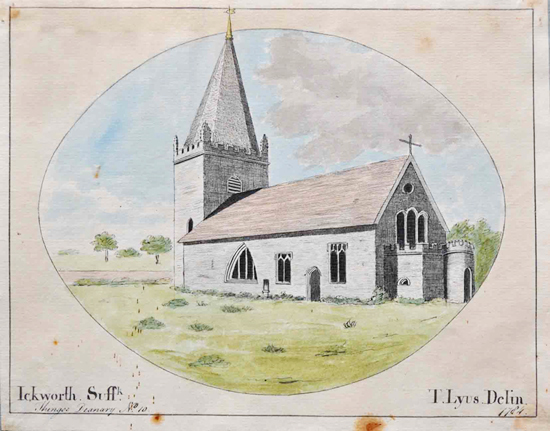 The first was in 1778, when the 3rd Earl of Bristol, Augustus John, built the tower, laid down memorials to family ancestors, built a burial vault, and converted the pulpit into a three-decker. The second major redevelopment was carried out in the early 1830s by the 1st Marquess of Bristol. 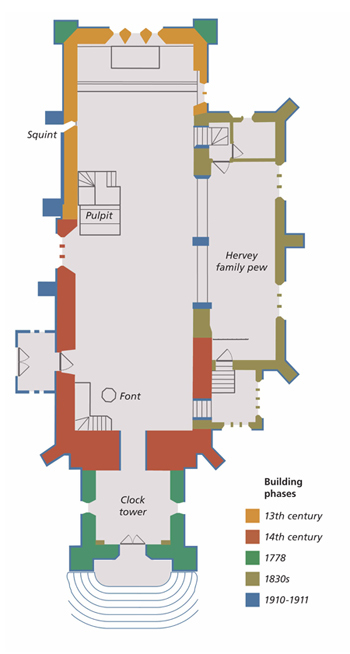 The south aisle and family pew was built with a new family vault below, the north and west porches were added, and the tower was heightened and given a clock. It is thought that William Ranger oversaw this redevelopment. He was a civil engineer and pioneer of small factory-made concrete blocks, for which he held two patents. In the south aisle and vestry, you can clearly see Ranger's concrete blocks, almost unprecedented in church building at the time, and which make the south aisle such an architecturally significant construction. The third redevelopment by the 4th Marquess of Bristol took place in 1910-11, to the designs of architect Arthur Conran Blomfield, who was also working on Ickworth House. This replaced the north porch, the tower pinnacles and the roof. A completely new stained glass was installed in the east window, dedicated to the memory of the 3rd Marquess who had recently died. During the installation, a number of 16th-century stained-glass roundels were moved to windows in the nave and chancel. It was during these works that the medieval wall painting of the Angel of the Annunciation was uncovered. The subsequent years of the 20th century saw little change in the church. When the National Trust took over Ickworth House in 1956, it remained in the possession of the Church Commissioners, who declared it redundant in 1984. 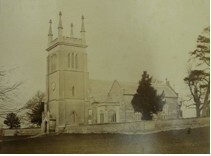 Two years later the church and churchyard were purchased by the 7th Marquess. Unfortunately, very little maintenance was subsequently carried out and its condition deteriorated until in 1998 it was put on English Heritage's Heritage At Risk register. The 7th Marquess died in 1999 and ownership of the church was unresolved until 2005, when it passed to the 8th and current Marquess. A year later, the 8th Marquess transferred ownership to the Ickworth Church Conservation Trust, a charity specifically created by the Marquess to restore and safeguard the future of the church and churchyard. After major fundraising efforts and generous grants from the Heritage Lottery Fund and English Heritage, the church was restored in 2012-13. In June 2013 an opening Service of Blessing was held by the Bishop of St Edmundsbury and Ipswich, and the church reopened to the public.